The GIO Series GRX40Z from Ibanez is an electric guitar made from poplar with a metallic light blue gloss finish. 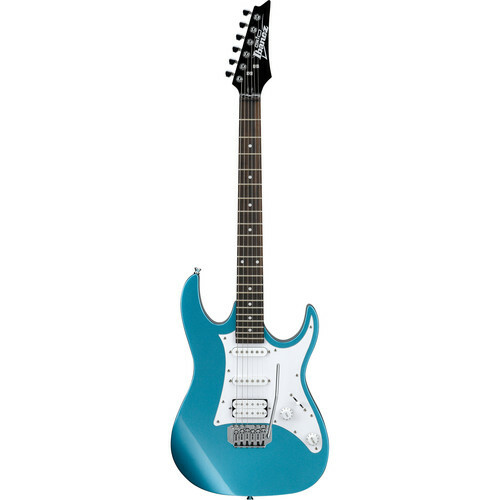 Its bolt-on maple neck has a rosewood fingerboard with white dot inlay. The solid double-cutaway body delivers a resonant tone with natural sustain, while the Infinity humbucking and single-coil pickups offer a variety of tones with depth, warmth, and rich dynamics. Using the 5-way selector switch, you can choose between pickup combinations, which can be further adjusted with the master volume and tone controls. For hardware, the GRX40Z is equipped with a traditional-style tremolo bridge and standard tuners. This attractive and affordably priced instrument is an ideal choice for beginners, and is well suited for playing all musical styles.